Five things that are true: one, there is a spider in my apartment. He is fat and round like a ringmaster, brown and fuzzy. 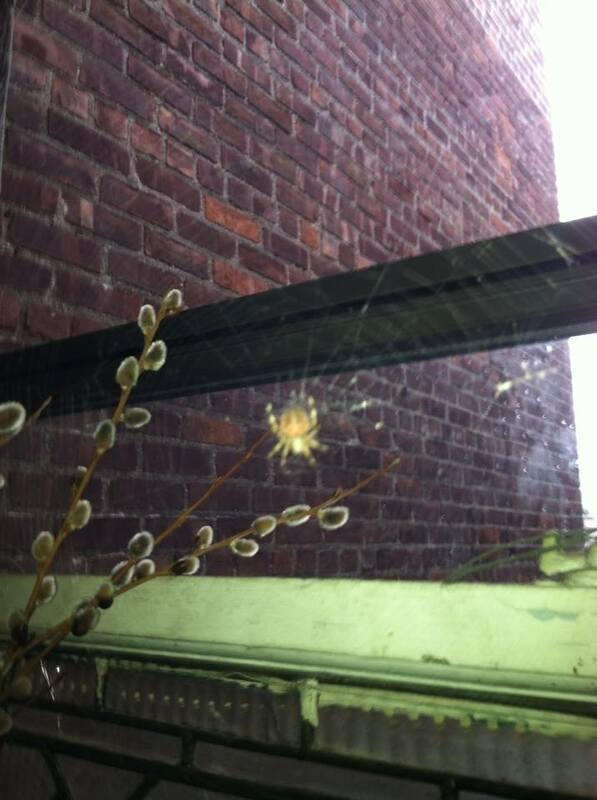 He has a huge web in the living room, between a tattered white stained glass window that is leaning, and the real window. Behind him is a view of the sections of the building that jut out, grey brick. I think we are all a little afraid of him and admire him in equal measure. Two: my room has two windows. There are trees in both of them. One is too small for anyone but a squirrel to climb through, and the other is big enough for me to climb out of and stand on the black and rust fire escape, holding onto the ladder to the roof. There are screens for the windows behind the radiator, but not having screens reminds me of Rome, and so I will tolerate a few flies. Three: today I found a coffeehouse I could write in, and of course, this is a great relief. It is a ten or fifteen minute walk from my place, down a boulevard with big trees and park benches, where a lady sat on a bench and knitted purple yarn, and a young man on a bike picked up a blanket and rode back to give it to a lady pushing a stroller with two kids in it. Four: last night after dinner I got groceries and flowers in a neighborhood more familiar to me, and took a cab home. Cabs are the most luxurious thing in the world. I had to tell the man in the turban how to get to my place, only slightly stressful as I had not done that in a car yet, but he dropped me right in front of my building, and all I had to do was carry my fifty pounds of groceries up four flights of stairs. I remember from being in college that one grocery shops differently knowing one will have to carry the groceries a ways. Liquids are the worst. As I wiggled my key in the front lock, my neighbors were on the sidewalk listening to the electric slide and laughing. If I had been feeling social, I might have put aside my prejudice against the electric slide. I had already been in a bar with people buying me shots of strawberry tequila and nutmeg bourbon, and I had had enough people and enough booze. Five: this city is somewhere else, with me living here, and I am someone else, living here. I don’t know what it is, or who I am, but I am now feeling lively enough to wonder. The actual moving days, the process, was ghostly. Most of the summer, my emotions ranged from panicky to less panicky. I am starting to have some other feelings. Some things that could be true but aren’t: moving here has been so exhausting, this was a terrible mistake. Or: moving here is really brilliant and is going to change everything for me. I could still think something about a big, famous city would make me more real. I think if I had done this when I wanted to, which was always before now, I might have thought that. My heart is only more tender for how hard it is to feel significant and real and honor your own experience, whether that is in a place that is so crowded and loud that one may feel creative pressure to say something special, or a place that is so unknown as to suggest that a person could never be important there. I went to Coney Island and saw there is another ride I am going to love: Ghost Hole. Having no substance, then, how does the ghost have a hole in it? I’m sure they meant it a hole filled with ghosts. Do they all like to hang out together, really, ghosts? I guess they could all be in the same place all the time, if they have no substance.